I didn't beg to be in any discords, I'm in a few Blockland discord/discord with Blockland users in them, I was just seeing if there were more I could join. I like talking to people and playing games. I made a post here asking if there were any open ones I could join. Posting myself shirtless =/= posting my 'abs'. I don't even have abs lol. And I posted it because I felt like it. I have some dignity, you clearly don't and you're deflecting. 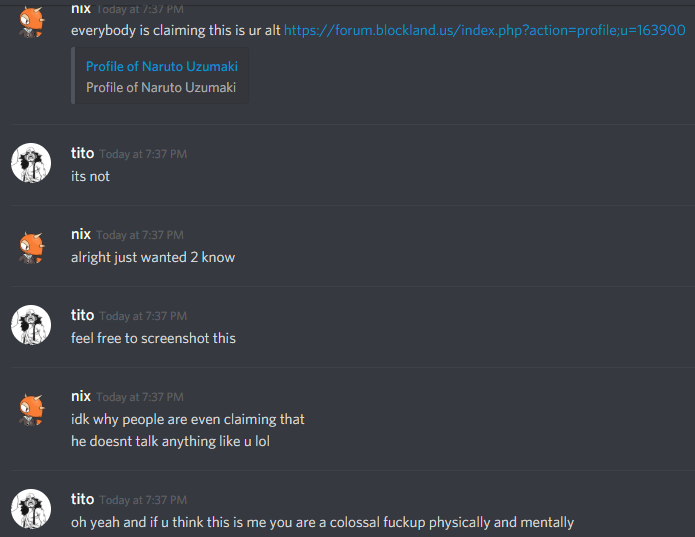 This is pretty obvious judging the fact you made an alt just to come and flap your gums and try to make me feel bad about my physique and some thing I accepted myself doing 4+ years ago and don't care about anymore. Where's your picture at? I'm not really aggressive and anyone who talks to me personally would agree with that, I just like to lay it in to people who I think are being stupid. You should probably just forget off to your band of equally pathetic spugs, because it's all you have. Who else are they going to blame for the dying community? This event has allowed me to look inward and say, if I do host a floating city build server again it will be a Floating City RPG.